This page is about the BMW motorcycle models R50/US, R60/US, R69US, R50/5, R60/5, R75/5, R50/6, R60/6, R75/6, R90/6, R90S, R60/7, R75/7, R80/7, R100/7, R100S, R100RS and the R100RT. This info may apply to some later models too. One can easily see that the structure has 4 horizontal and 2 vertical elements. Both vertical parts must be parallel and in the same plane. The 4 horizontal parts hold the 2 vertical ones in alignment. If any of the 6 elements is bent, then the whole structure is out of alignment. If the parts were perfectly rigid, then if any one is bent, all 6 are bent. In practice, it pretty much works that way. Once in a while we would find a "good" part with the rest of them out of spec. This is an illustration of the 4 horizontal and 2 vertical parts of the (fork) structure. 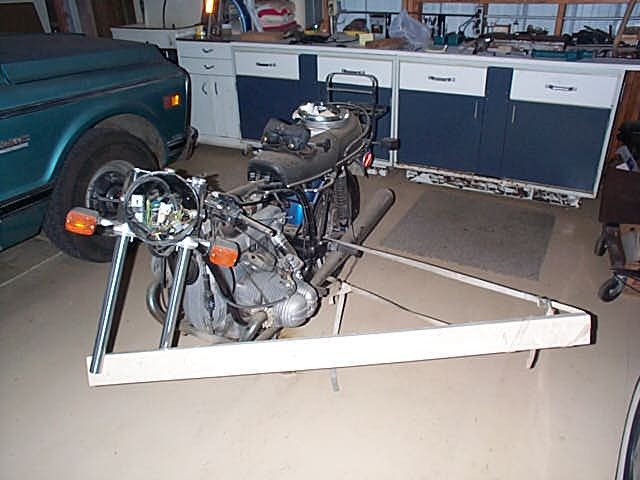 If the axle is removed, then the fork legs will easily flex and seem not rigid. Once that the axle is installed, the whole structure tightens up and becomes useable. The early telescopic forks came out in 1968 on the old /2 frame. The factory "whisper" is that they wanted to give them a good test before installing them on the all now /5 models that they knew would soon be released. We had some problems with some of them. The problems continued into the /5 series. Some seemed to work just fine and some had stability issues. Nobody in my shop had any significant telescopic fork experience. What we didn't know is that the BMW forks were far more rigid than the competition. We knew about the well advertised longer travel. If all else is equal, the longer the travel, the less rigid is the fork. BMW was using a fork that had super rigidity in comparison. It the parts are stronger, then the forks must be in even closer alignment to do the telescoping needed to keep the wheel on the road. Alignment, that was the problem. The BMW specs were checked and some forks were out a bit. It was about then that Roy Reynolds told us that he found that the forks had to be in nearly perfect alignment to work. He wasn't super confident about it as he had only a small number of bikes running around for a database. We soon found that he was perfectly correct. Wobble after wobble was cured after we would really go through the fork and bring all specs to near perfect. BMW allowed .004" (.1 mm) out of parallel or plane, but we were finding that a bike needed to be near zero error. On a factory visit, I found that BMW had no check of fork alignment at any point in the assembly of the motorcycle. How can that work? It didn't and we often found them well out of the .004" spec. All of the top clamps, or plates had the holes punched in the wrong places to allow the tubes to be parallel. The lower clamps were usually perfect. Sometimes new fork tubes would be well out of tolerance. About 1/2 of the fork braces were crooked and would "pull" the tubes out of alignment. Even the rear brace for the /5 front fender would be a factor in getting the axle to go in smoothly. The brake stay arms were all crooked and needed to be lapped in. Our first technique of tightening the top three caps would twist the alignment far off of where we had left it. Using a torque relief arm fixed that procedural error. Below are the procedures and tools to check and correct the alignment. This fork tool is a homemade tool for testing the parallelness (Is that a word?) of BMW fork tubes. This tool could be made in other ways, we just used whatever we had that was laying around. It is made of 4 parts. The far right part is aluminum from a damaged lower clamp that was in our junk pile. One clamp will make two of these parts. It is sawed off to get it's curve, as it will follow a fork tube. A standard "V" block could be used instead. The short stud that normally clamps the fork tube in place is removed and a longer one screwed in. The longer stud is made from a /5 BMW cylinder stud and cut off just long enough (8 inches) to reach the other fork tube. A tab is welded onto the stud to hold the dial indicator. I forget what BMW part I used for that. An ordinary dial indicator is bolted onto the tab. It is reported that one BMW rider went to Harbor Freight and bought a V block and a dial indicator for about $30. 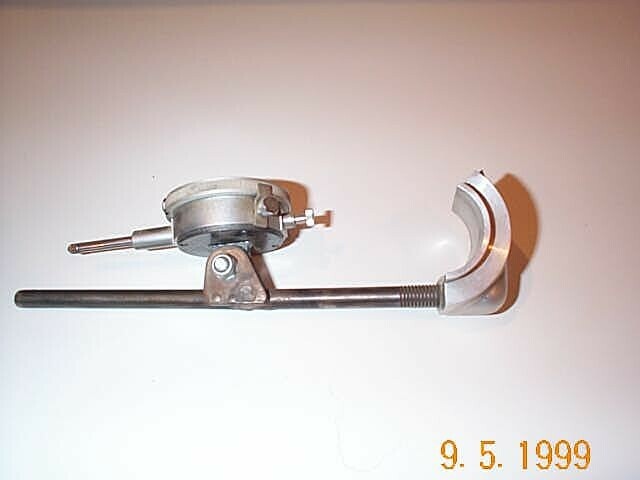 The picture shows the tool in place. Just put it against a fork tube with the stud resting against the other tube, zero out the dial, slide it down and read the change. This change shows the parallelness of the fork tubes. BMW specs call for .1mm or .004" as maximum. We found that .004"-.006" could cause a severe wobble. Our spec became .001" or about perfect. One must use neutral hand pressure while measuring this one. It is weak at this point because the lower two parts of the structure are missing, see image above. An unsupported fork tube can be pushed over (flexed) enough to show anything. A small built in error is caused by the dial spring pressure pushing the fork tubes apart. It is very small and that's where we felt it might be as much as .001". The tip of the dial indicator may want to drop into the holes in the fork tubes. BMW says that the tubes should be facing inwards. The reason for that is that they fear a burr on a hole edge and don't want it to be on the bearing side of the fork leg. They want to reduce wear on the inside of the leg. I have never seen a burr and have never heard of anyone seeing this problem. Far better to dress the burr off and be done with it. From the perspective of fork operation with perfect parts, it matters none where the holes face. You will see the wear marks on fork tubes and it may pay to have the bearing side now opposite. This will make the wear part on "new" material. Rotating the tubes so that the holes now face outwards should shift the wear points. This is a very cheap and easy way to measure the "flatness" of the forks. This one is made of mirror glass, but any plate glass will do. It is 9" X 15." Ask a glass shop for it to be made of any old scrap of plate or mirror glass. Scratches aren't important. Be sure they grind off the sharp edges. I have never paid over $4 for one. They break easily so you might want to buy two of them. Hold it as shown and with the other hand, tap lightly on the upper right and left corners. It should be a "dead" tap on each. Usually one will have a "click" to show that they aren't "flat." The error can be measured, but it takes a good feel. Stick a feeler gauge or shim stock under the glass where it clicks. When you find the right size then neither side will have a "click." To correct it, the bolts that hold the springs and top plate must be removed. Now the lower clamp is the only thing holding the tubes. Measure it again. If it's ok, then the process of tightening the bolts is the problem, very common. If it still shows an error put a bar ( I use a 2X4 ) between the tubes, twist it against the fork stop. Tie it in place with the tubes tweaked about 1/2" and leave it overnight. This allows for "cold flow." This clamp is sometimes called a BMW triple clamp, or tree. The aluminum seems to have memory. Measure the "tweak" to see which way it must be twisted to correct it. Put a 2 X 4 between the tubes and pull it back against some point on the rear of the bike. Don't worry about bending the tube. I like to leave it for a day or two. Don't worry if it's too much, it will come back easily. Then I tweak it back and it only takes a fraction of the time or torque. It should be left for a day or two in the flat position to see if it stays that way. Once it is stable then proceed with fork assembly. For the BMW forks with exposed tubes ( R90S ) a smaller glass can be cut that will fit. The accuracy isn't as great, but usually will show any error. On the next measurement it should be bent the other way about 1/2 as much as it was previously bent. 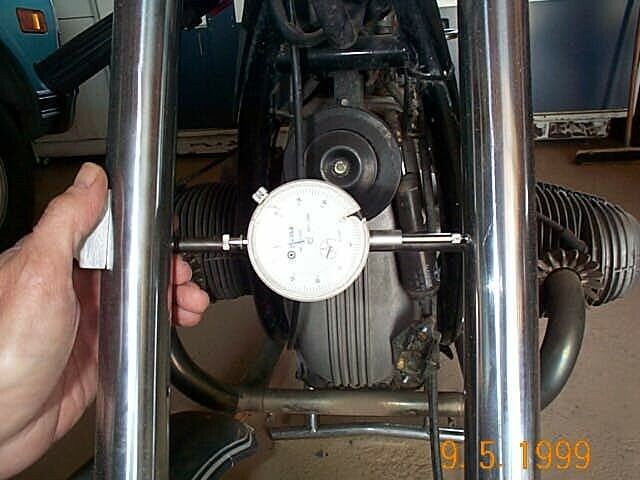 The glass plate can be used as a quick and not very accurate way to measure for a bent tube. Lay it against one tube in the front and hold it up against the very top, next to the clamp. They always bend just below the clamp. Look for light at the top. One could put it in the back and look for the bow about 2 or 3 inches below the clamp. This method won't show small (.002) bends. If this method shows a bend then it is significant, but may miss a smaller, but still important one. To really check a tube, remove and roll it on "V" blocks and measure with a dial indicator at a point just below where the clamping spot. If that shows Ok, then try several places along the tube. In 1973, BMW sent out about 30% of the tubes as new parts that were bent. I imagine that some of these are still around. Fork tubes can usually be straightened up to about .030." The area between .030" and .050" is iffy. Over .050" has never been successful for me. If one is replacing the fork springs, removing the top clamp or putting a wrench on any of the two outer top clamp nuts, this may be of interest. Always use a "torque relief bar." You must NOT turn either of the two outer big bolts while the forks are against the fork stop on the bottom clamp. It will twist the fork tubes out of alignment. Taking it off isn't so serious, but putting it on is very important. 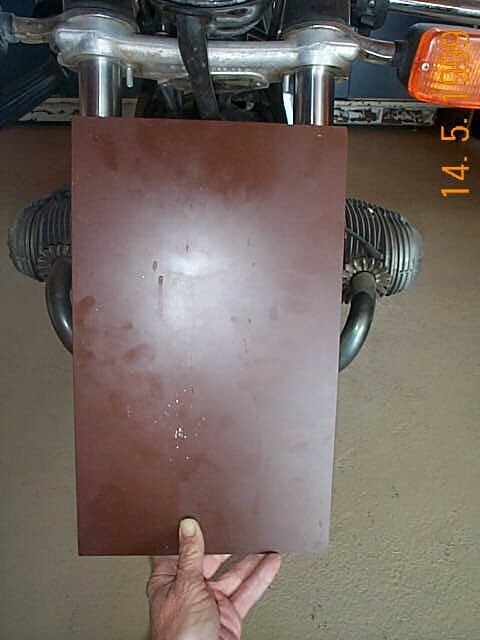 The torque relief bar is just an old piece of metal that I have around. It rests between the center nut and the left big one. See how the two "levers" are about 90 degrees apart? That gives you maximum effect. 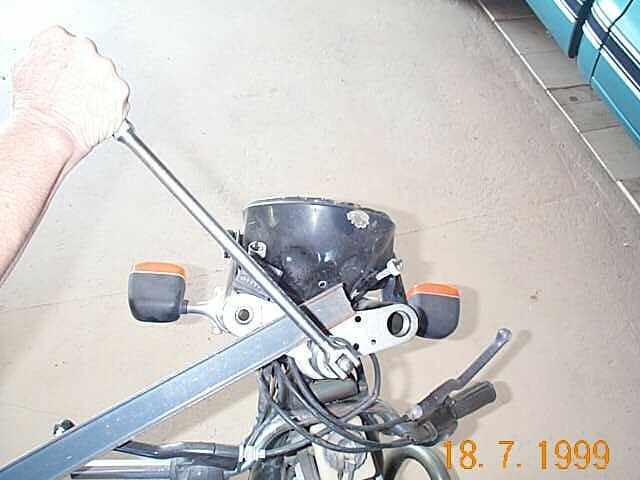 This torque bar is to keep all of the strain on the top clamp, not on the fork stop. If you tighten any of the two outer nuts without a torque bar, then it "winds up" the fork tubes as they are being tightened. Then they are held in place, out of alignment. The socket for the two outside nuts may need to have the inside bevel ground off so that it is flat. Otherwise it may jump up and "round off" the corners because 80-90 ft lbs is a lot of torque. While putting new shocks and fork springs on my '84 R100RS yesterday, I used the excellent tip by Duane Ausherman. It is posted on his web site. It involves using a length of angle iron between the center nut and opposite cap nut to insure that the forks weren't being twisted and locked into the twisted position while tightening the cap nut. However, I was working alone and it was hard to hold the angle iron and wrench in place, while simultaneously applying the force necessary to tighten the nut. After a few minutes of thought, the answer occurred to me -- use a small C-clamp and clamp the angle iron in place to the flat steel top plate. Once clamped, it was easy to hold the angle iron and forks steady while tightening the cap nut. Hope this tip helps others make a tough job MUCH easier! One of the other parts that usually need to be straightened is the fork brace. It is extremely strong and hard to straighten. The two ends that are bolted up against the fork legs must be in the same plane. To check it, one may use the glass plate. A straight edge is no substitute for a plate. Lay one end, the solid part that is really a casting, on the plate and push down. Does the other end lay flat. Try to wobble it. Let one end slide off of the glass and keep pressing down on the end still on glass. Does the free hanging end easily slide back onto the glass. It may be lower than the edge of the glass. Now try the other end. When you think that you have it aligned, try to fit in onto the studs. It probably won't fit. The final test is to lap it on the glass. First hold down on one end and move the other one. Then switch ends. Check the wear pattern. This one is a real bear and may take hours to fix. I have seen the "push the axle through freely" test fail because of the brake stay rod being twisted. It is easy to lap "flat." You want every part of the forks to be installed and not push, pull or twist the fork legs. If they are stressed in any way, then the axle won't go through freely. It must be totally free. This is not easy to attain. One can replace the fork springs without misaligning the forks by being very careful. Afterwards, always check for stiction and make the axle test. Often mechanics have replaced the springs and didn't know of this trap and that caused stiction and the handling went away. The problem isn't one of springs, but alignment. It is easy to try to solve one problem, but cause a bigger one. My special thanks to Albion Baucom for making this page for me in the days when I knew even less about building a page. I wanted to get the info out long before I was able to do it myself. Albion was quick to volunteer his help. Randy Glass has written an article on his fork rebuild on his 1979 R100RT. While it is specific to one model, it applies to the telescopic forks since 1968 up to early 80s. I highly recommend this article, as it is the definitive article on forks. He ran out of server space and removed it. Now it is on my site.